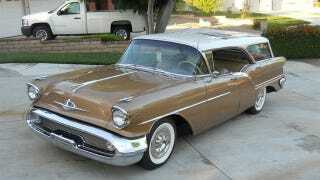 It is a rare occasion when you stumble across any 1957 Oldsmobile Super 88 Fiesta Wagons, restored or otherwise. When you take into account the fact the beautiful wagon seen here is still wearing the paint it left the factory with 54 years ago, you begin to understand how rare it truly is. This Fiesta Wagon is currently on Ebay and I want to own it—badly. Judging by the fact there are 275 people also watching this Ebay auction we aren't the only one's lusting after this Fiesta Wagon and it certainly isn't hard to understand why. All it takes is a quick look around to realize the Fiesta Wagon a station wagon built with styling and performance in mind. From the pillarless four door design to the 371 ci Rocket T-400 V-8 underneath the hood, it's clear this station wagon was built with more than just utility in mind. 8,981 Super 88 Fiesta Wagons were built in 1957, but judging by how rarely see them we can't imagine too many survived. The rarity and style of the Super 88 Fiesta in the unbelievable original condition seen here should tip you off to the fact this example isn't going to change hands at used station wagon prices. With over 3 days left, bidding is already well over $30,000 and there is no indication if the reserve is in sight. We imagine the bidding won't stop anytime soon as it will probably be quite a while before such a nice original Super 88 Fiesta Wagon comes up for sale. Let me know if anyone wants to volunteer for financing the perfect weekend Jalopnik staff vehicle.